While many see it as ‘black magic’ or some kind of hi-tech parlour trick, predictive analytics is actually the opposite of crystal ball gazing – it’s data, algorithms, seriously clever people and detailed models of future behaviour based on vast volumes of past behaviour. In short, it’s facts. It’s also the fuel that gives marketing the power to overstep the customer creepy line. That’s the line where customers are no longer comfortable with the level of detailed facts a company expresses back to the customer. Overstep the line and rather than encouraging warmth and loyalty, you’ll be fending off a consumerist restraining order, negative word of mouth and customer retention problems. Consumers want relevant offers, communications and interactions but don’t want that stalker feeling. Just look at the US example where the analytics and marketing teams at Target used transactional data (especially what combination of goods were purchased) to determine transactions that are likely to indicate a customer is in the early stages of pregnancy. Using that insight, the marketing team personalised discount coupons for baby items to customers identified as ‘likely just pregnant’ – a highly relevant offer delivered at the right time. The furore began when a teen’s father (unaware of his daughter’s recent pregnancy) complained about Target’s blatant promotion of pregnancy to teens. See the creepy line? Feel the power? Welcome to the world of predictive analytics. A world where mathematics and statistics combine with marketing and business to find patterns in data and extrapolate those patterns to future scenarios to reduce costs, improve processes, increase response rates and boost revenue. 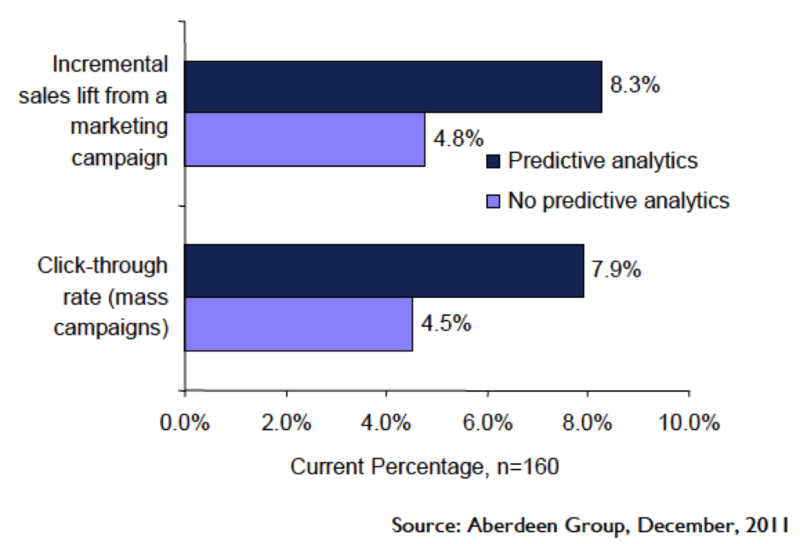 <p>Aberdeen Research reported companies using predictive analytics experienced a 75 percent higher click through rate and a 73 percent higher sales lift than non users.</p>. 3 percent increase in operating profit margin. Sounds so good there’s got to be a catch, right? There is. You need data, lots and lots of quality data (behavioural, transactional, unstructured and social media data) to accurately identify and extrapolate patterns; and you need the right clever people (analysts) to understand the data and build the models the predictions rely on. Obviously your company also has to be ready to act on the outcomes of the analysis. You would have experienced predictive analytics in daily life already. Credit scoring and instant ‘decisioning engines’ rely on intricate models. Websites with recommendation engines also use a form of analytics to predict the items you’re more likely to purchase based on your data, your browsing history and models built from the billions of bytes of previous visitor data. The public sector use predictive analytics to help to predict future demand for services so infrastructure and other public service project decisions can be made to align demand with supply – just in time services if you will. Large organisations, particularly in industries with immense volumes of transactional data such as financial services and mobile phones, typically have a team of analysts working on developing, monitoring and adjusting predictive models, and have the budgets to afford the sophisticated analytics technology to crunch the data and models and deliver insights business managers can act upon. Up till now, sophisticated analytics was beyond the budgetary, resourcing and maturity reach of many SMB companies. But times are changing. With market maturity, reduced cost of computing power and pay-as-you-use or cloud operational models, many technology vendors are offering self-service or on-demand analytics for SMBs. Cloud-based models relieve upfront licence costs; built-in, ready-to-use typical models reduce the analyst requirements; and automated graphical dashboards deliver insights so anyone can understand the implications. Traditional vendors such as SAP, SAS, IBM and Pitney Bowes Software (formerly Portrait Software) all have enterprise-grade analytics solutions that power some of the most sophisticated, marketing-savvy large organisations. They also have offerings suited to all but the smallest SMB with a graphical, ‘friendly’ interface so business managers can extract insights without quite so much analyst input. Now with an insight rich vista before you, how are you going to use those insights? As shown in the earlier Target example, sometimes it’s best to detune offer relevance to stay on the right side of the creepy line (Target actually changed the coupon content to mix totally irrelevant discounts – eg. lawn mowers – with the baby goods discounts to stay within customers’ comfort zones). Every customer segment will react differently so you might need to experiment and test to find the right mix of relevance and comfort level. You’ll know pretty quickly if you’ve overstepped the creepy line! Note: If you’re one of the clever analyst people (or want to be one of them) the industry group, Institute of Analytics Professionals of Australia (www.iapa.org.au) might be worth checking out.